Sachmo has one of the best temperaments and is very laid back and easy going. He is a very sweet pup that is affectionate and very food motivated. A bit shy, just like his mother, Sachmo isn't in love with the show ring though he finished quickly and easily. He blended very easily into our pack and really loves playing with all his brothers. He is a half-brother to our Griffyn but has a very interesting pedigree and was an out-cross breeding blending an all-American pedigree with a blended Scandi pedigree. The result has produced a very moderate male with easy movement and correct angulations with a sweet disposition. Sachmo became pointed from the 6-9 month puppy class in AKC conformation at just 6 months, 4 days old with the judge who awarded him the points remarking that he is a "very nice puppy." Sachmo then went down to Chino, CA for the PHCA National and Western Specialties and was awarded WD/BOW from the 6-9 month puppy class for a 5-pt major! At the National he was rewarded RWD. Sachmo finished his championship at 11 months of age going over to Ohio and taking WD/BOW for his final 5 point major. 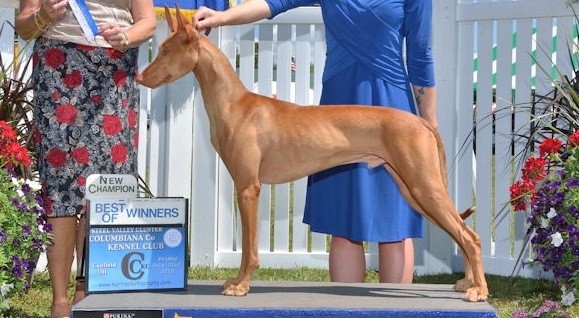 WD, BOW, 5 pts (major) New AKC Champion!!!!!! !